Home Blog Low Flow Sampling: What’s New and Why? Low Flow Sampling: What's New and Why? Low Flow Sampling and Purging is a relatively new technique, based upon the use of a submerged pump that can be adjusted to deliver ground water to the surface at rates from less than 100 m per minute to a maximum of 1 per minute. The purpose of this technique is the recovery of representative samples of the water in the formation adjacent to the well screen. Stagnant water above the screen and below will not usually be purged or sampled. The technique is also called “Low-Stress” purging and sampling, as it does not cause excessive movement of water from the soil formation into the well. Ideally, the flow rate of water from the pump will approximate or be less than that entering the well from the surrounding formation. The technique eliminates the need for removal of several well volumes prior to the collection of samples, thus reducing the amount of IDW (Investigative Derived Waste) from wells containing contaminated water. Typically, by using a Low-Flow Purging and Sampling technique, the volume of water removed from a well will be a few liters, compared to more than 10 times this amount using the older, multiple well volume purging technique. Today purging and sampling are conducted as a continuous process. This new technique is designed to allow the collection of representative ground water samples from the formation surrounding the screened section of the monitoring well. The pump is placed within the screened section and all water pumped is monitored for a number of chemical and physical parameters using a flow cell and field instrumentation. Water levels will also be checked to ensure that draw down is kept to a minimum. Care may need to be taken to ensure that the pumped water is protected at the ground surface from temperature extremes and excessive sunlight during the monitoring process. Sampling commences when the measured parameters have stabilized and turbidity is at an acceptable and constant level. 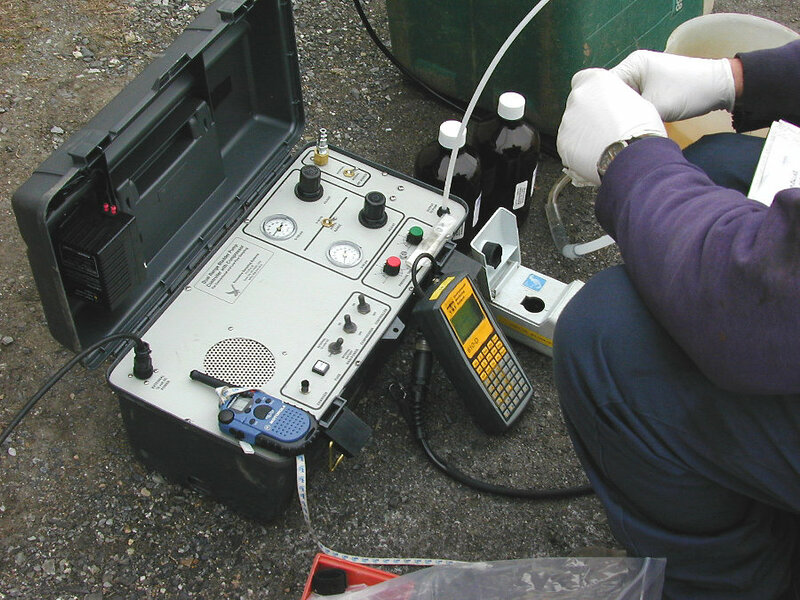 The success of any ground water sampling program is dependent on several factors. First and most important is a properly constructed and developed monitoring well.See ASTM Standard Practice D 5092* and Guide D 5521* for construction and development respectively. The wellhead needs to be secured and sealed to prevent vandalism and surface/rain water intrusion. Improved sample quality, accuracy, precision and variability through reduced disturbance to the well and formation, reduced mixing, analyte dilution, aeration and degassing. Reduced purge water volume (90-95%), leads to savings in disposal costs. Improved detection and resolution of contaminant distribution through sampling a smaller section of the formation. Improved ability to quantify total mobile contaminant load, without need for filtration. Increased well life, through reduced pumping stress. Reduced time for purging and sampling may reduce field labor costs. Significant technical and cost benefits at sites, suitable for Low-Flow Purging and Sampling. A dedicated or permanently installed pump is preferred over portable systems as the sampling event will be easier to conduct and quicker. No decontamination of the in-well components will be needed. Neither will it be necessary to wait while the disturbance caused by the installation of the portable pump settles, prior to commencing purging and sampling. A pneumatic bladder or electric submersible pump is required for pumping along with a controller that is capable of providing an adjustable pump output from less than 100 m per minute to 1 per minute. Durham Geo Slope Indicator's ½-inch, ¾-inch and 1 inch diameter MBP Mini Bladder Pumps and 2 inch diameter Sample Plus Electric Pumps are well suited to Low-Flow Purging and Sampling. Peristaltic pumps and other suction lift devices are not suitable for use in wells containing contaminants and/or measurable parameters that may be affected by the vacuum and degassing that occurs when these devices are used. Grab samplers, such as bailers and inertia-lift pumps are also unsuitable as they create too much disturbance to the water column. Tubing and suspension cable will be needed to connect the bladder pump to the surface as well as an electric cable for the electric pump. Durham Geo provides polyethylene, Teflon® lined polyethylene and Teflon® tubing for the MBP Bladder Pumps. Tefzel® motor leads with or without a PVC or Teflon® lined polyethylene hose are available for the Sample Plus Electric Pumps. Durham Geo Slope Indicator Sealed and Lockable Well Caps are recommended for their MBP Bladder Pumps as they provide both a means to suspend the pump at a specific depth and an easy means to connect the pump to the controller and monitoring equipment through the use of bulkhead fittings attached to the underside of the Well Cap. Precise control of air pressure and timing of the pressure and exhaust cycles is essential for control of the MBP Bladder Pumps. Durham Geo Slope Indicator supplies the Precision Dual Range Controller with independent circuits for the application of 2-50 psi and 5-100 psi air to the pump and adjustable cycle timing from 0.1 to 10 seconds. A self-contained Compressor with Precision Dual Range Controller is also available. It is specifically designed for Low-Flow Purging and Sampling and it eliminates the need for an external supply of compressed air for applications up to 50 ft deep. Durham Geo Slope Indicator Sample Plus Electric Pumps are powered by either a 120 volt 60 Hz or 12 volt DC powered controller. Both models provide a variable speed control for a precise pump rate. Water level monitoring is an essential part of this technique. It is used to ensure maintenance of the water level in the well as close to the static level as possible during purging and sampling. Durham Geo Slope Indicator supplies Water Level Meters with either round polyurethane cable or flat Tefzel tape and ¼ in, 3/8 in or 5/8 in probes, depending on model selected. Tapes and cables are clearly graduated in 1/100 ft.
A new MBP Draw Down Controller and Water Level Meter with user settable draw down from 0.05 ft to 0.45 ft will be available early 2004. This simplifies the control of the water level in the well by automatically stopping the bladder pump controller at the maximum draw down point and restarting it when the well has recharged to the user set level. This device should be used in wells where the maximum permissible draw down has already been determined. Measurement of several chemical parameters is used in Low-Flow Purging and Sampling to indicate when purging is complete and sampling may begin. The measurements may be made periodically or preferably on a continuous basis using a multi-parameter probe installed in a flow cell connected to the outlet of the well pump. Durham Geo Slope Indicator stocks a standalone turbidity meters by LaMotte. Samples should be obtained directly from the well pump outlet and not from the flow cell outlet. Durham Geo Slope Indicator can provide a suitable Two Way Diverter Valve that may be installed between the well pump outlet and the flow cell. The pump rate used for purging may also be used for sample collection or it can be reduced to ease filling of small containers or vials. Collect samples for analysis of the most sensitive parameters first and any samples that require filtration last.